What is a Nevada Sublease Agreement? Nevada Sublease Agreement: What Is It? 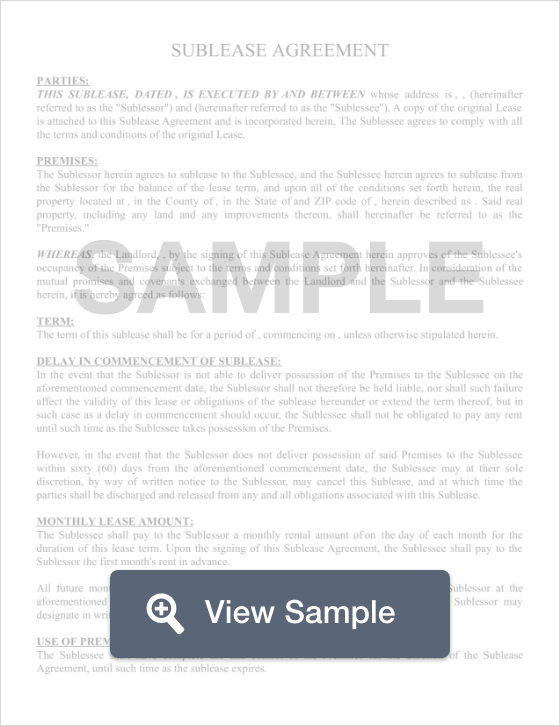 In Nevada, a sublease agreement is a legal document between a tenant and another tenant that establishes a rental agreement. In this type of agreement, the original tenant of an apartment (known as a sublessor) finds another tenant to take his or her place in the unit (known as a sublessee). When the agreement has been signed by both parties, the new tenant will move into the apartment and pay rent just as the original tenant did, never causing a lapse in rent payments to the landlord. These types of agreements are generally short-term agreements, lasting anywhere from one month to the duration of the original lease term. One important fact about a sublease agreement is that the original tenant’s name remains on the lease even when the sublease agreement is in effect. This means that if the sublessee doesn't pay rent on time or damages the property, the original tenant will be held responsible. According to Nevada Tenant/Landlord laws, a tenant must receive written approval from the landlord before proceeding with a subleasing agreement. Nevada law states that a landlord is not required to be reasonable in his or her decision to accept a subleasing proposition or offer.